Patent reveals folding, zero-emissions car. As modern vehicles grow increasingly complex, Ford sees an opportunity to simplify things for emerging markets. The company recently filed a patent for a vehicle that appears to draw inspiration from one of Ford's earliest vehicles, the 1903 Model A. The new design has several features that will help it be both affordable and capable of handling inadequate infrastructure. 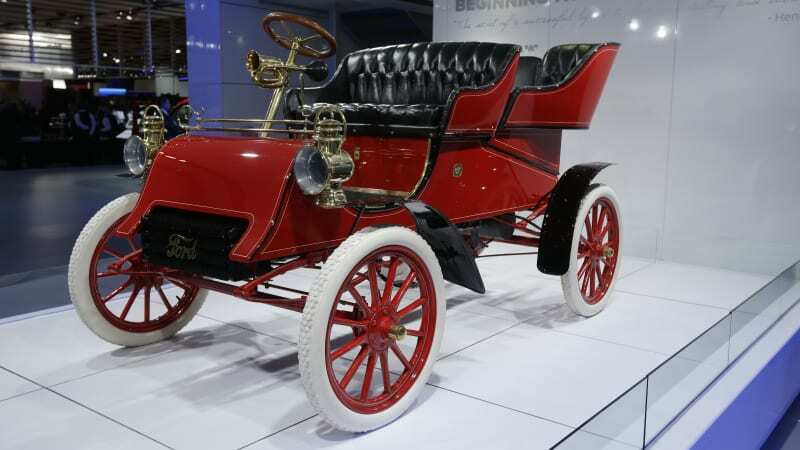 While in its time, the 1903 Model A (pictured below) was one of the power powerful passenger cars on the road with its two-cylinder, eight-horsepower engine, its design is primitive by today's standards. The vehicle could seat two passengers thanks to its bench seat and had simple controls. The vehicle's utilitarian approach proved to be fruitful, as Ford made an impressive profit off of a vehicle that helped set the stage for the transformative Model T.
Ford's latest patent reveals a similar design to the Model A with a minimalistic design that will bridge the gap between cars and bicycles. The sketches portray a vehicle that looks like a pedal-powered go-kart with various seating arrangements with simple running gear. The lightweight vehicle uses the fewest parts possible required to be classified as a zero-emissions electric vehicle. The patent indicates that the frame could carry an internal combustion engine or an electric powertrain that could send power to one or both axles. The modular vehicle, which features X-shaped frame members that can pivot at a central point, can be folded to decrease its footprint when parked. That feature would surely come in hand in congested cities. The vehicle can also be configured to accommodate up to six passengers. Depending on the driver's needs, the vehicle can be transformed for one passenger, two passengers in tandem, two passengers side by side, four passengers (like a traditional vehicle), and six passengers in three rows of twos. Various components can also be added to the vehicle, which include a pickup bed, floors, and roof frames. This isn't the first time an automaker has patented a folding car, as Hyundai came out with a similar concept in earlier this year. Ford's modular, simple vehicle looks like the perfect car for emerging and extremely congested countries, like Africa or China.